We just celebrated our tenth anniversary. Ten years! Holy moly! I don’t know what makes me feel older–turning thirty, having three kids, or being married for ten years. Honestly, it might be the ten years of marriage. I mean, I thought we had accomplished something great after just one year, but TEN YEARS?! That’s legit! The past ten years have been hard but good. We went from doe-eyed “babies” to genuine adults who have struggled with, fought for, prayed through, and cried over our relationship. 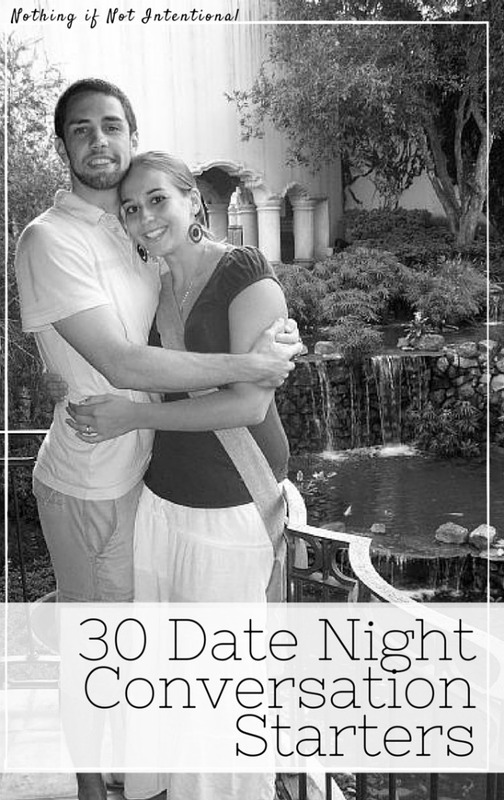 One of the ways we fight for our marriage is through our commitment to date nights. There are weeks when date night is the only time we get to have serious adult conversation, and I need adult conversation. And I do mean “need”–quality conversation is my love language. But there are times when it’s impossible to get out for a date night, or we simply need some new ideas to move our conversation from “Did you take out the trash?” to something more meaningful. And this is where these date night questions come in handy. Some are silly. Some are serious. I hope they all lead to great conversation for you and your spouse/date. 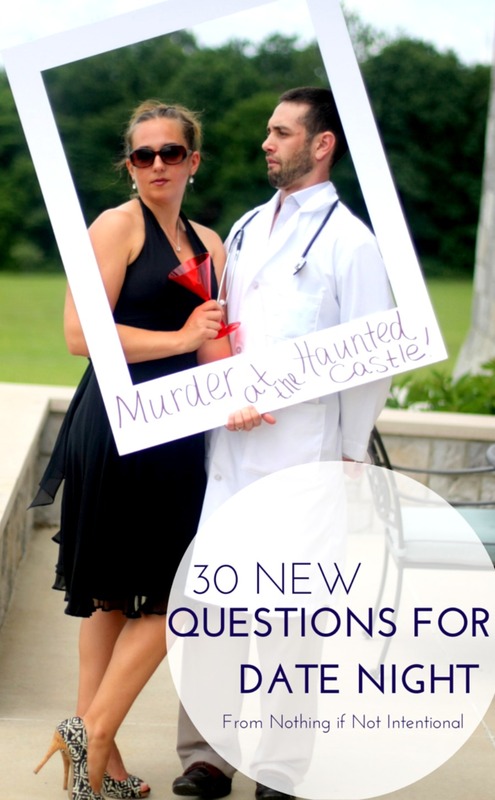 If you’d like a printable version, you can print this list of date night questions and conversation starters HERE. Where do you see our family in five years? Do you remember a time when you were really afraid? What happened? What was your favorite vacation you took as a kid? What dream vacation do you want to take with our kids? Describe three parts of your day and how you felt about them. What’s your love language-physical touch, service, words of affirmation, gifts, or quality time? What makes you feel loved? If we had a completely free Saturday, what would you want to do? In your opinion, what’s the best date we ever went on? What’s your favorite memory from the last year? What’s been your biggest money mistake? If you had one more hour each day, how would you use it? If you had $10,000 to give away right now, where would it go? If we went to a counselor/therapist tomorrow, which of your own weaknesses would you be willing to discuss? What would be off-limits? What legacy do you want to leave for our family? How do you want to be remembered? What’s one habit of mine that drives you nuts? Which household task/chore is your least favorite? What couples do we know whose marriages you think are worth modeling? If you no longer had to work, how would you spend your time? What movie title best describes our life? If you could relive one day of our relationship, what day would it be? What similarities do you see between me and my parents? Which of my friends do you think are influencing me to be the best version of myself? If you had to quit your job today and start something new, what would you do? If you could go back and do one year/season of your life differently, when would it be and what would you change? Now that we have three kids and our foster tot has to have state-approved babysitters, there are times when we have a date night at home. I know some couples feed their kids earlier in the evening and then have a dinner date after the kids are in bed. In which case, a pizza you don’t have to prepare or order is a great and easy option. 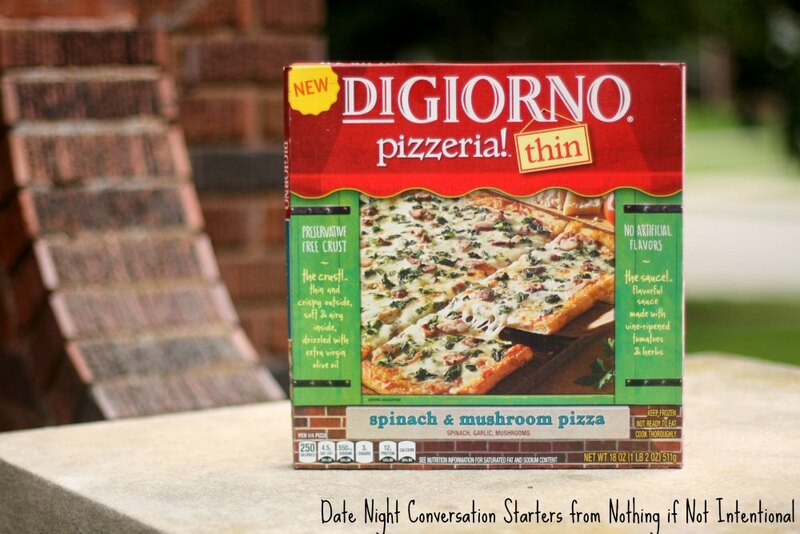 DIGIORNO claims that the new pizzeria!™ thin pizzas may be the most delicious frozen pizzas yet, and I have to agree. Our favorite was the Supreme Speciale (with caramelized onions, red & green peppers, premium pepperoni, Italian sausage). Because we’re not ashamed of our love of meat. But don’t just take my word for it! 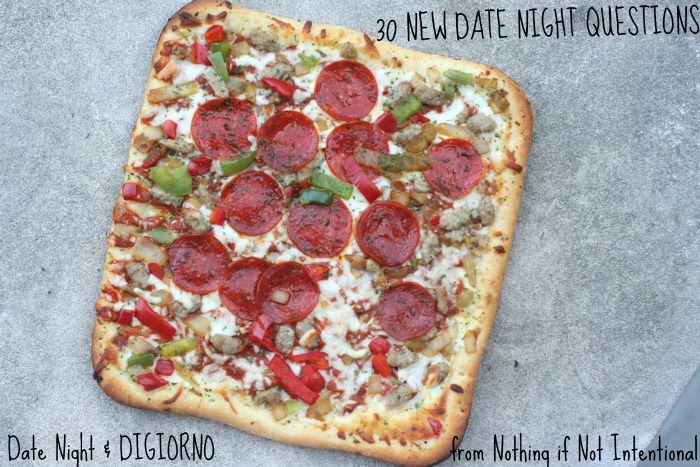 DIGIORNO is so confident you’ll agree that new pizzeria!™ thin is delicious, that the company is offering a “Love It Or It’s Free Guaranteed” refund. If for some reason you try the new pizzeria!™ thin and don’t like it, you can visit DIGIORNO.com for more information on how to receive a refund. But if you love it, tell the world! Visit the DIGIORNO Facebook or Twitter page (@DiGiornoPizza), to share feedback and pictures using the hashtag #YouBeTheJudge.